This collection was sent as press sample. We’re not otherwise affiliated with the company. New indie alert!!! Well new to me. 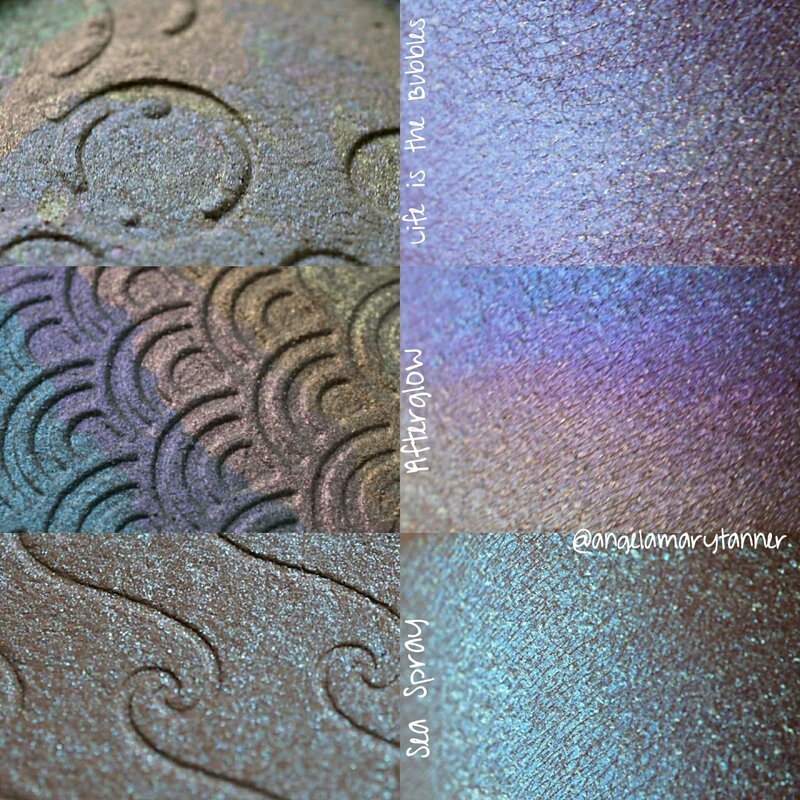 I’m sure that you guys have already heard of Bitter Lace Beauty, the original creator of the rainbow highlighter, but I’ve never tried their products before. 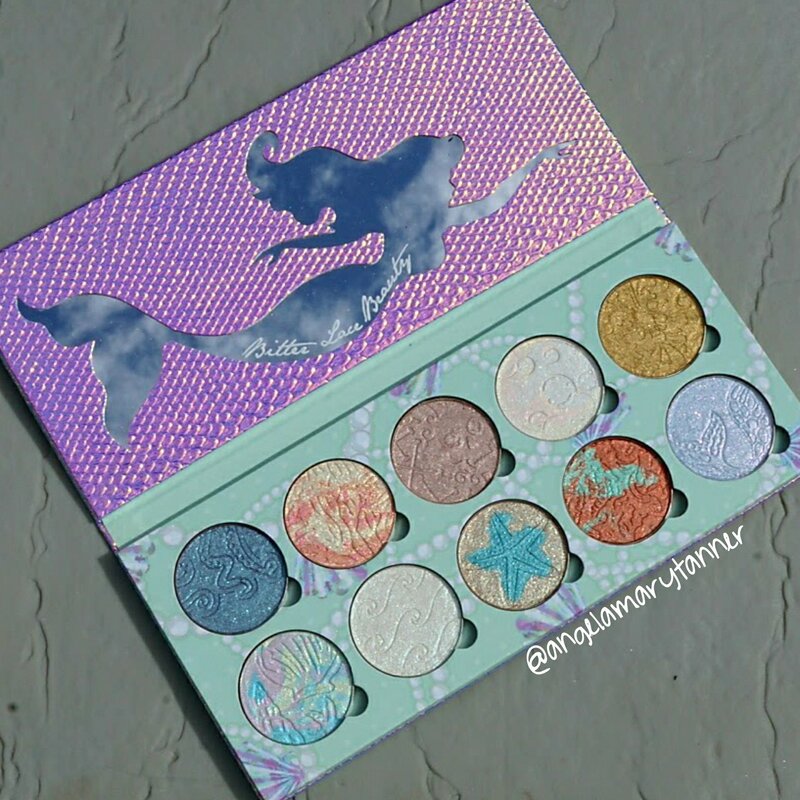 I’m super excited for the opportunity to review their ‘Mermaid Dreams’ collection! 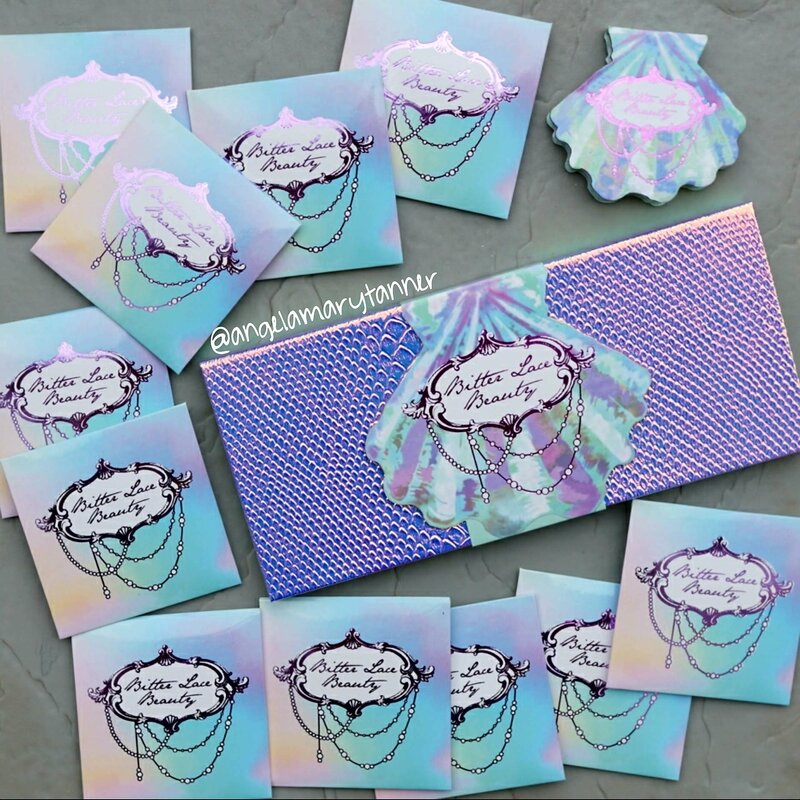 The collection includes eleven 44mm highlighters and a palette and compact. There’s a bundle option and everything is sold individually as well. The empty compact is $8. First things first, the highlighters smell incredible. They’ve got a fresh beachy scent that makes me want to eat them. And of course they all have gorgeous marbled patterns and intricate hand stamped designs. They range from $18- $22 in price. 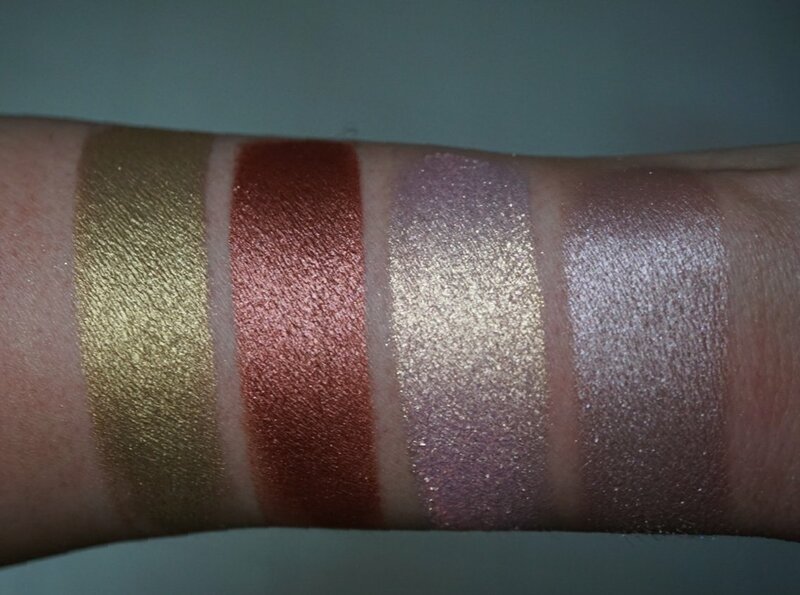 Out of these four, the only one that’s light enough for me to use as a highlighter is Shell Me About It. The other three I’ll use as eyeshadows. Shell Me About It is a mixture of blue, lavender, green and gold. Blended out it’s a translucent teal with subtle sparkle. 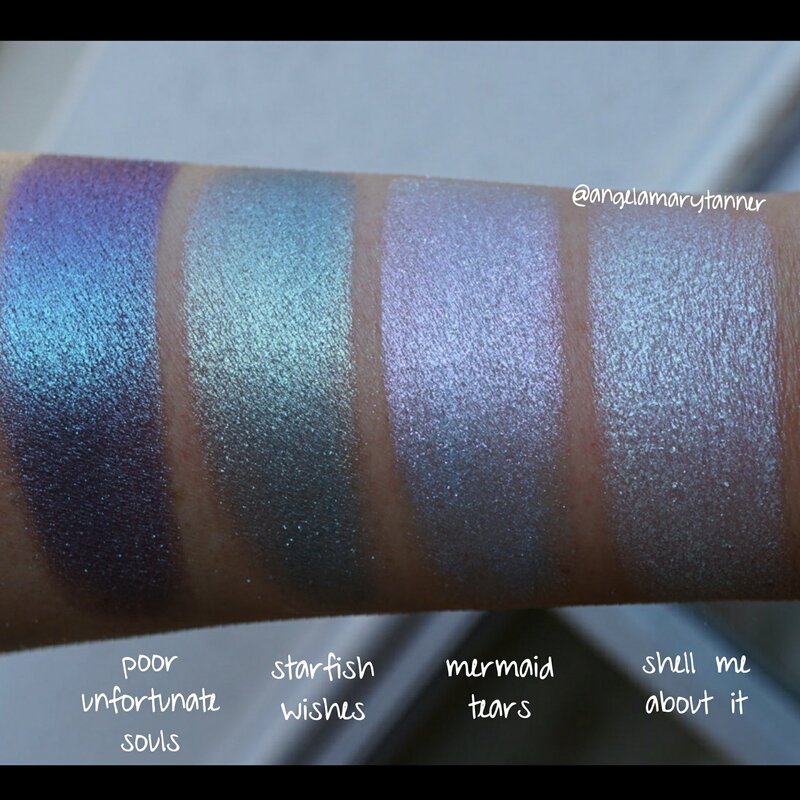 Mermaid Tears is a periwinkle blue with pink microglitter. 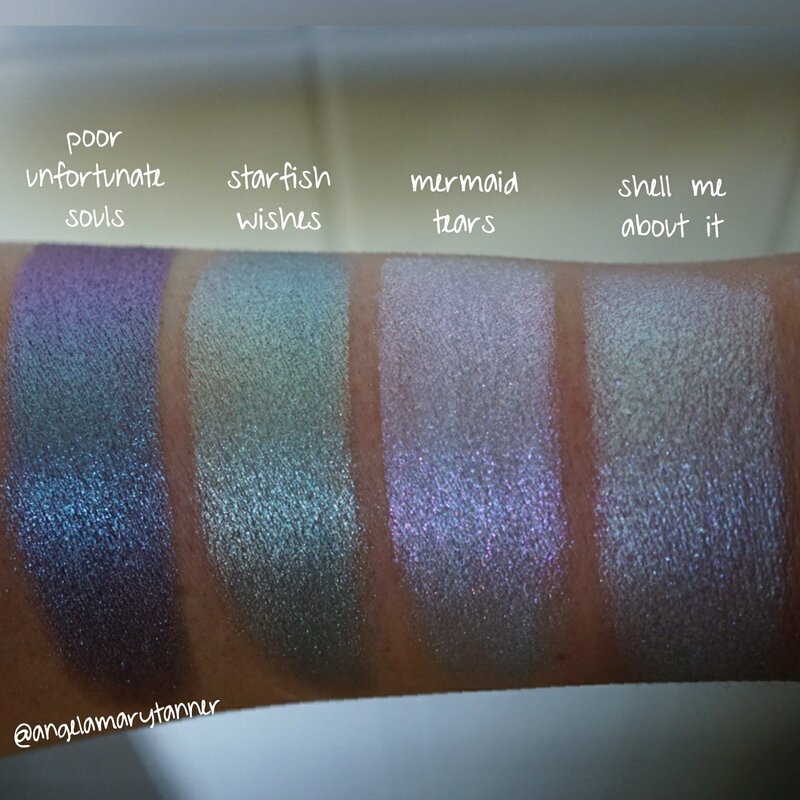 Starfish Wishes has a blue starfish in the center and a sandy gold around the perimeter. Mixed together it’s a teal and gold duochrome with green microglitter. 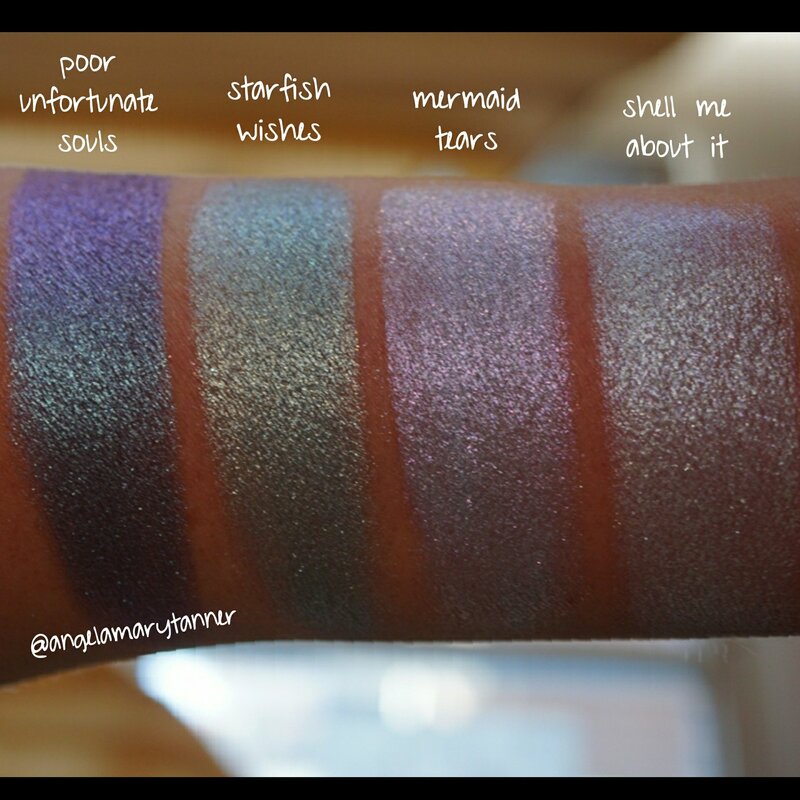 Poor Unfortunate Souls is deep blue and purple duochrome with blue sparkle. 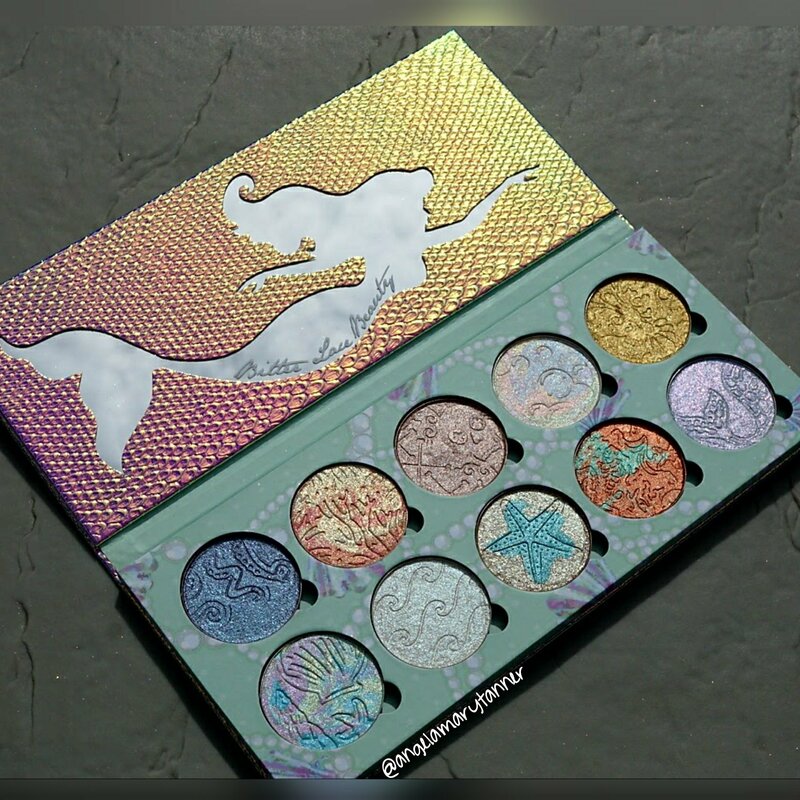 It reminds me a lot of a powder version of Colourpop Bae. 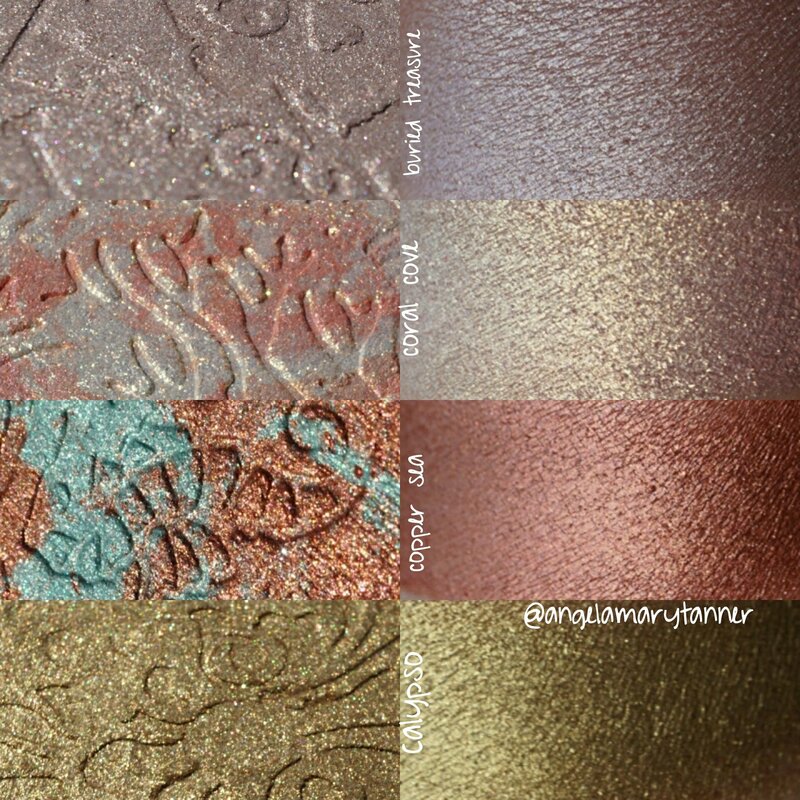 These next four are some of the more warm toned shades from the collection with the exception of Buried Treasure, which is neutral. 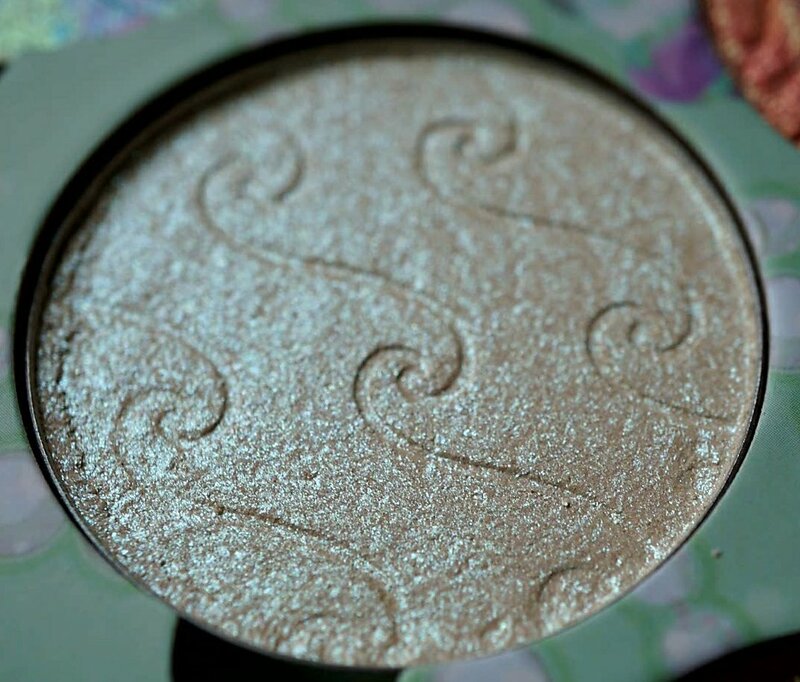 Calypso is an antique gold meant for skin tones darker than mine but my fellow pale girls and boys can use it as an eyeshadow. 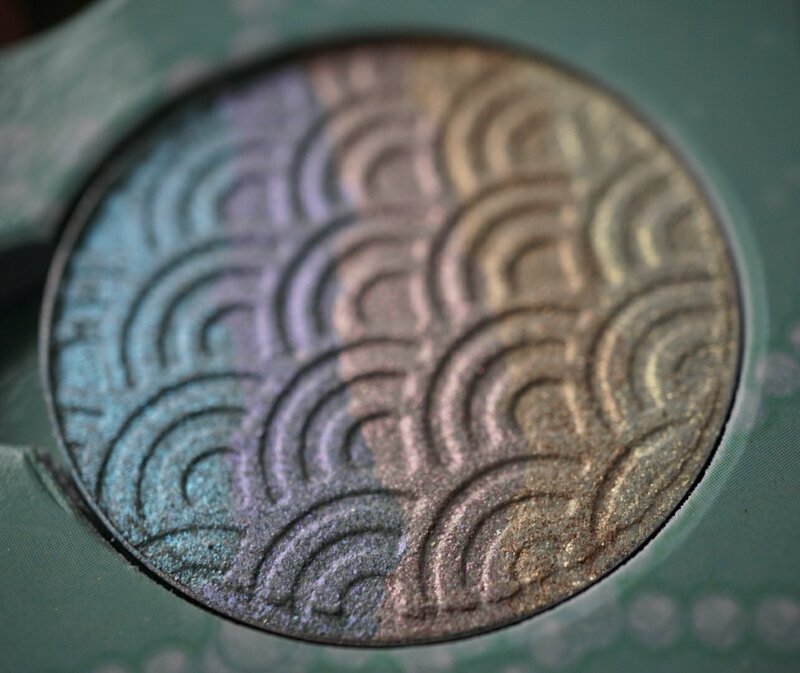 Copper Sea is a mixture a copper and green which sounds an awful combination but it’s surprisingly beautiful. 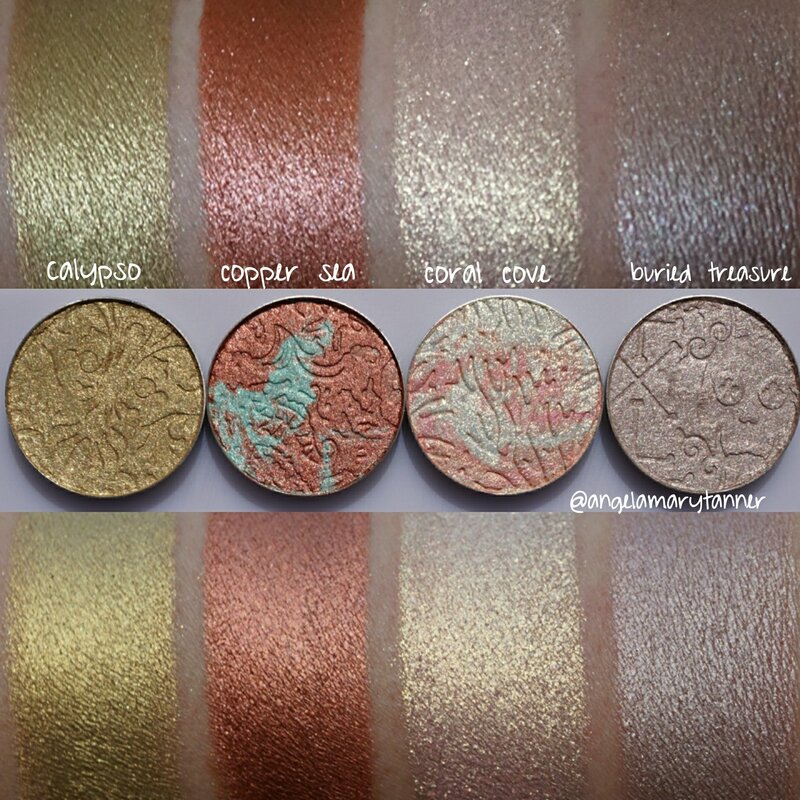 Mine is mostly copper and every pan will be slightly different but mixed together the two colors make a rose gold. Blended out Coral Cove is light pinky gold with tons of sparkle. 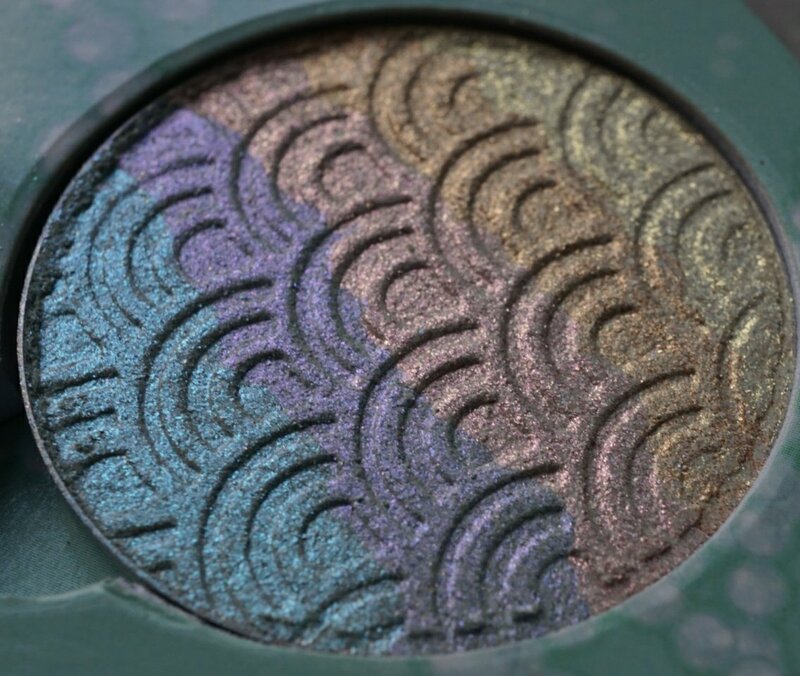 This one too glittery for me to use a highlighter but it would be a really pretty eyeshadow. 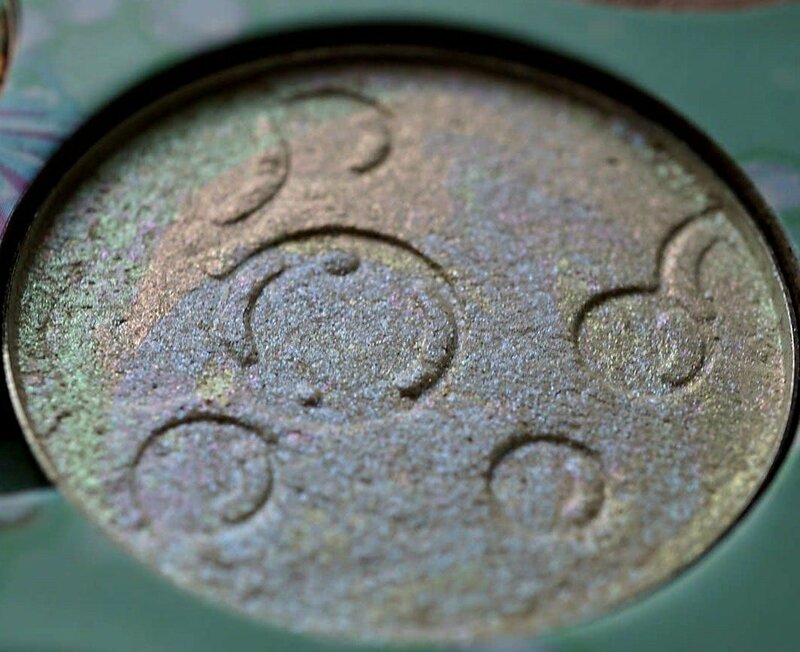 There’s a celestial eyeshadow from Nabla that’s nearly identical. Buried Treasure is a neutral pink with a nice sheen and minimal sparkle. I think it’s my favorite from the whole collection. 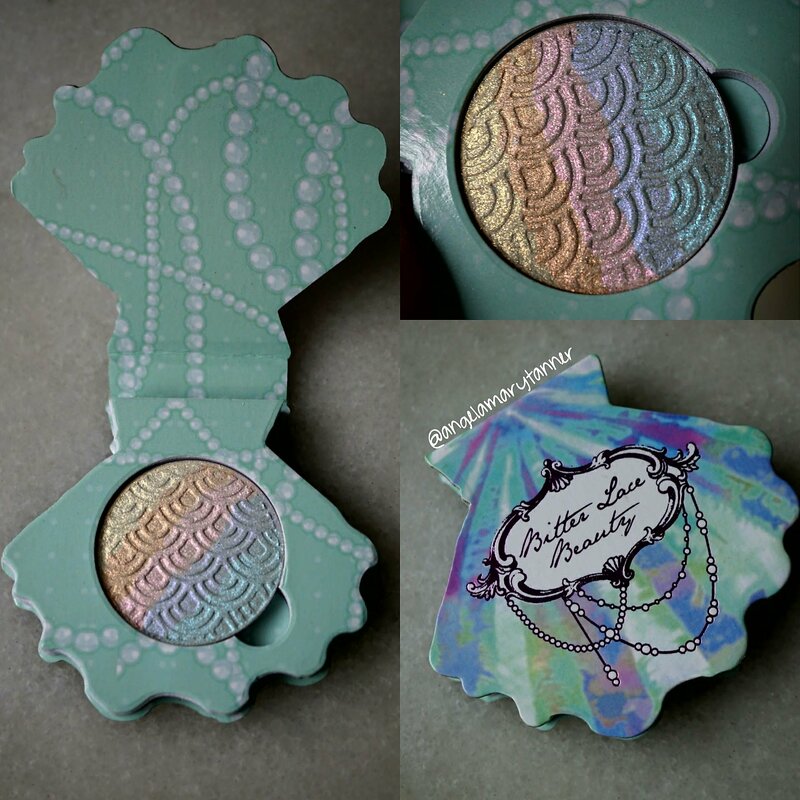 Last but not least, the three iridescent highlighters! 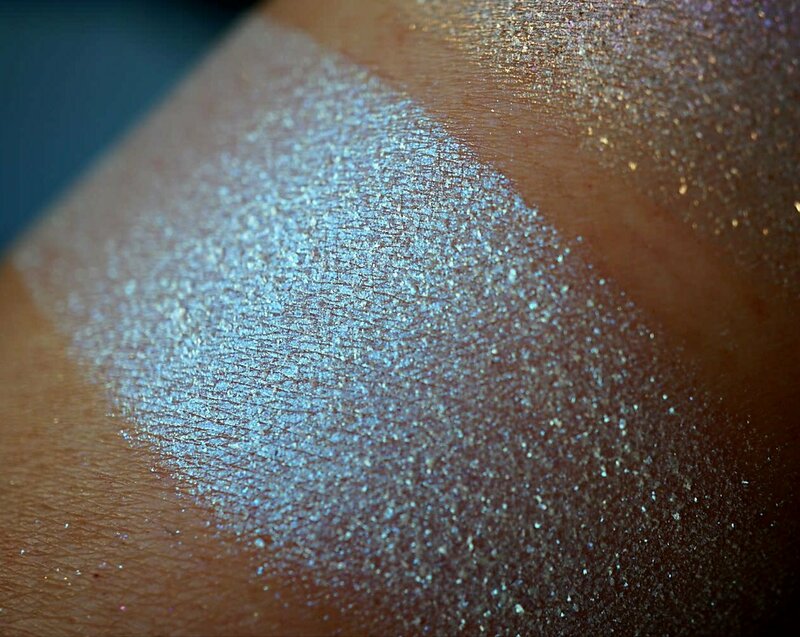 I’ve got to tell you that swatching this type of highlighter is the bane of my existence. As you know the majority of the products that I feature regularly aren’t sold in stores so you can’t just swing by Sephora and check out the colors and textures in person. Because of this I do heavy swatches so that you can clearly see the color and finish. 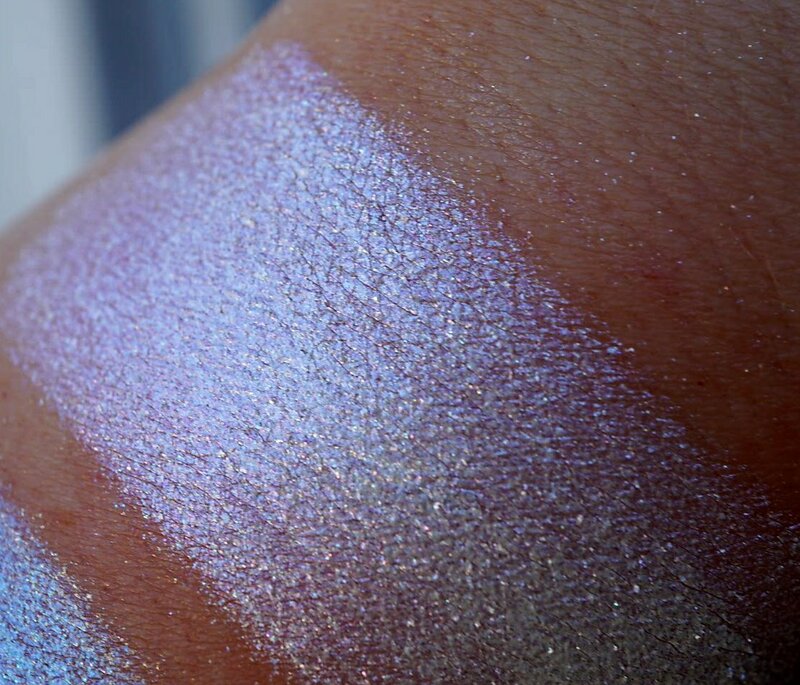 With these iridescent duochrome highlighters, you can’t swatch them heavily or else they look chalky. But then when I swatch them lightly the details don’t pick up well on camera. Sigh. When you look at Life is the Bubbles straight on, it appears white but from other angles you can see tons of pastel colors! Each pan will be slightly different but mixed together my pan is a cool toned blue with pink shimmer. 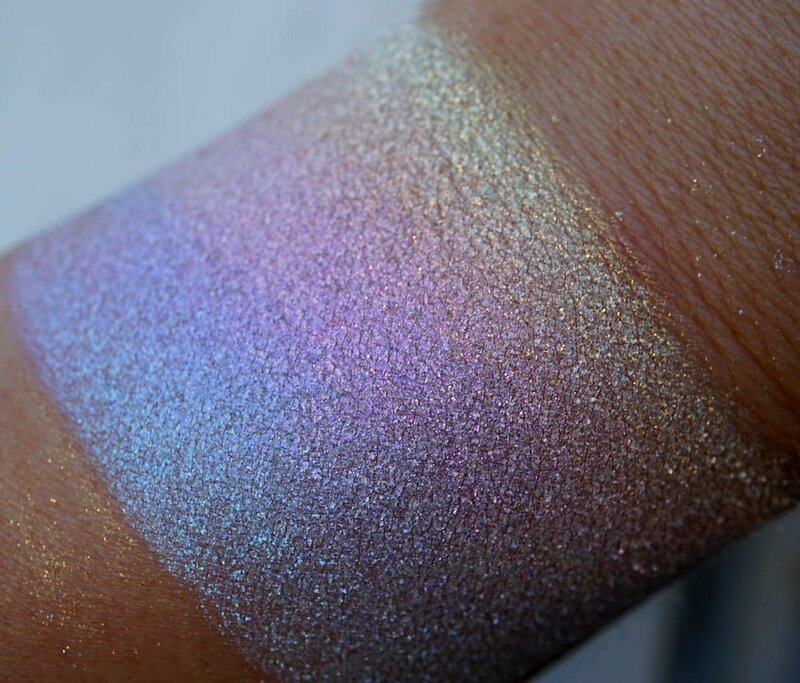 Afterglow is in iridescent rainbow highlighter! It’s half warm tones and half cool so you can vary your look depending on where you place your brush. 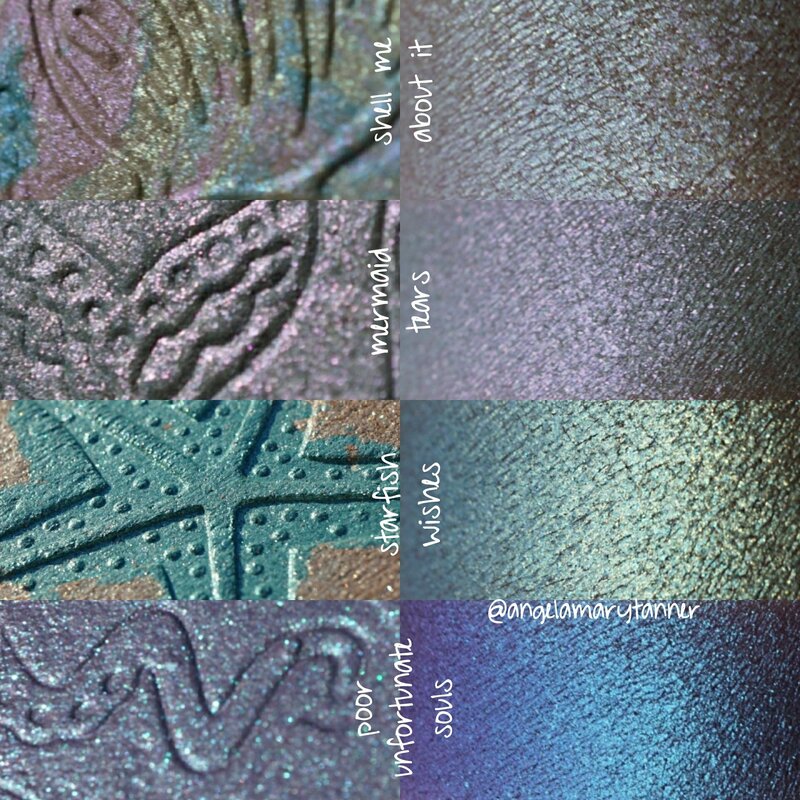 Sea Spray has a beige base with teal duochrome shimmer. So what are my thoughts? Well first and foremost the presentation is perfection. The attention to detail is impeccable and I adore the palette and compact. It is a pricy collection however. As I already mentioned the highlighters range in price from $18-$22, the palette is $35 and the compact is $8. The bundle is $214 which is a savings of $43, so basically you’re getting the palette and compact for free. 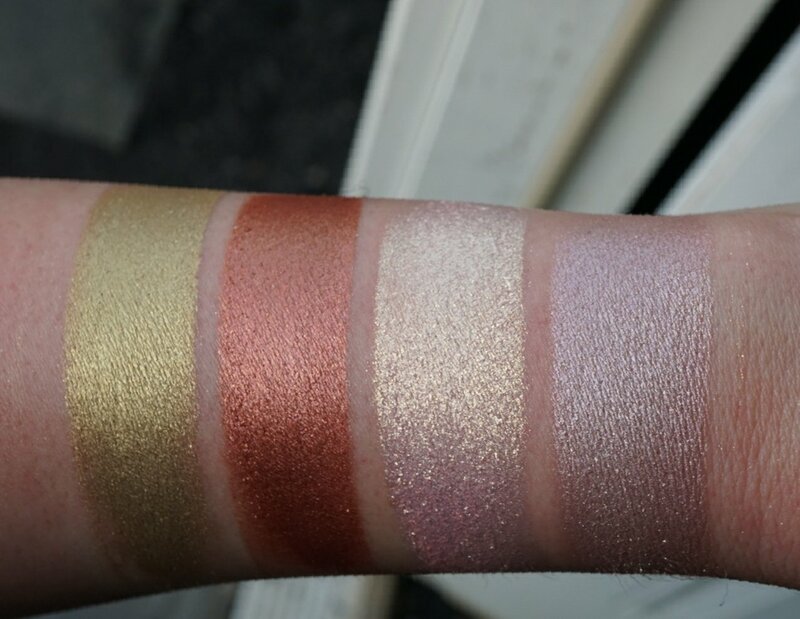 Here’s the thing with highlighter palettes though, in order to accommodate everyone a company needs to include light and dark shades with a variety of undertones. 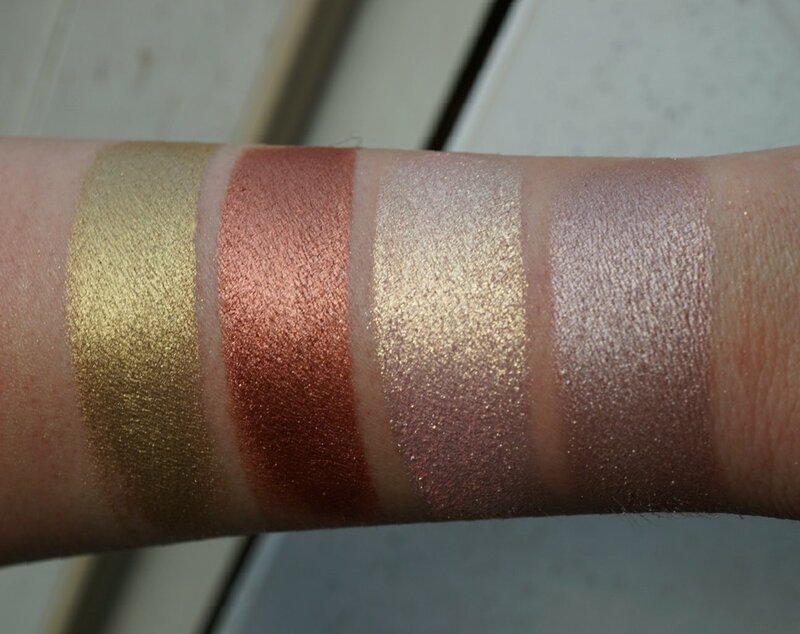 So you’re not going to be able to use every shade as highlighter. Just something to keep in mind. Also the collection is fairly glitter heavy. For those two reasons, I see myself using this more as an eyeshadow palette. Especially those top four cool toned shades. I want them all over my eyeballs right now! The bundle is a good deal but only if you can see yourself using all 11 colors. My favorite pieces are the palette and compact, Buried Treasure and the blues that I just mentioned. Have you ever tried any Bitter Lace Beauty products?